Focusing on bringing versatile, productive, eco-friendly solutions to the market, customers will get a preview of the new Genie® Z®-45 FE hybrid articulating boom lift at bauma 2019 — booth n° FM.711. Following increased demand for sustainable access solutions – in the 16 m (52 ft) range in the Europe, Middle East, Africa and Russia region (EMEAR), this new model is manufactured in Umbertide, Italy, and will be available across the region in early 2020. Designed using the same hybrid technology as its higher lifting Genie Z-60 FE (formerly Z-60/37 FE) sister model, the new Genie Z-45 FE boom lift offers a maximum working height of 15.92 m (51 ft 8 in) a maximum horizontal outreach of 6.94 m (22 ft 9 in), a maximum up-and-over reach of 7.50 m (24 ft 7 in) and a market-leading 300 kg (660 lb) maximum lift capacity in the 16 m (52 ft) hybrid boom lift class. As a result of its highly versatile, low emissions, energy-saving and low maintenance 4WD operation, this new machine combines the benefits of high rental returns on invested capital (rROIC) with the ability to work in virtually any jobsite environment, indoors and out. “Across our extensive portfolio, the 16 m (52 ft) range is where customer demand is the highest. 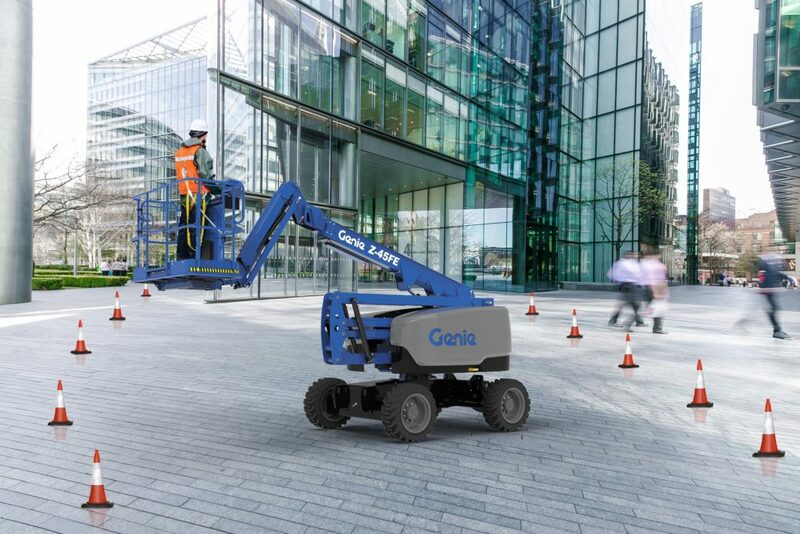 Today, the new hybrid Genie Z-45 FE boom lift offers the ultimate combination of environmentally conscious hybrid efficiency, exceptional 4WD diesel-like performance with the highly popular working height that our customers and their end users are looking for. But, this is not all,” says Zach Gilmor, Genie Product Manager, Terex AWP, EMEAR. Responding to today’s increasing environmental challenges and stricter jobsite regulations up to 16 m (52 ft) working height, the hybrid Genie Z-45 FE boom lift combines the power and performance of typical 4WD diesel machines, with the quiet, clean efficiency of 100% electric powered units. In ”All-Electric” mode, it provides the ability to work a full shift on a single battery charge. In “Hybrid” mode, it offers more than a week of run time on a single tank of diesel. And like its higher lifting sister model, in addition to a high-efficiency AC drive system that enhances driving performance and simplifies maintenance, the new Genie Z-45FE boom lift also combines the benefits of a full-time active oscillating axle system that maintains traction on rough terrain. Its 1.52 m (5 ft) articulating jib with a 135° vertical rotation provides the ability to position workers accurately. In “Hybrid” mode, the Genie Z-45 FE boom lift uses its environmentally friendly Stage V/Tier 5 engine-powered generator to maintain the state of charge of the batteries. With energy efficiency in mind, this hybrid system also allows the machine to recover energy generated when braking or descending inclines, which is in turn used to recharge its batteries. With its two modes of operation, the Genie Z-45 FE boom offers rental companies a versatile, sustainable and powerful “2-in1” solution adapted to indoor as well as outdoor applications, even where on-site electric power is not available. Requiring 30% less fuel than typical 36,5 kW (49 hp) diesel machines, it also offers the advantage of economising more than 25 Euros (28 USD – £21.50) of fuel a week and the ability to run for a full shift on an overnight battery charge. While saving energy, the hybrid Genie Z-45 FE boom lift also boasts intelligent, easy-to-use technology that significantly prolongs battery life while reducing operating and maintenance costs for excellent rROIC. Sleator Plant are the only official Genie dealer for the whole of Ireland and are on hand to help .. right now!